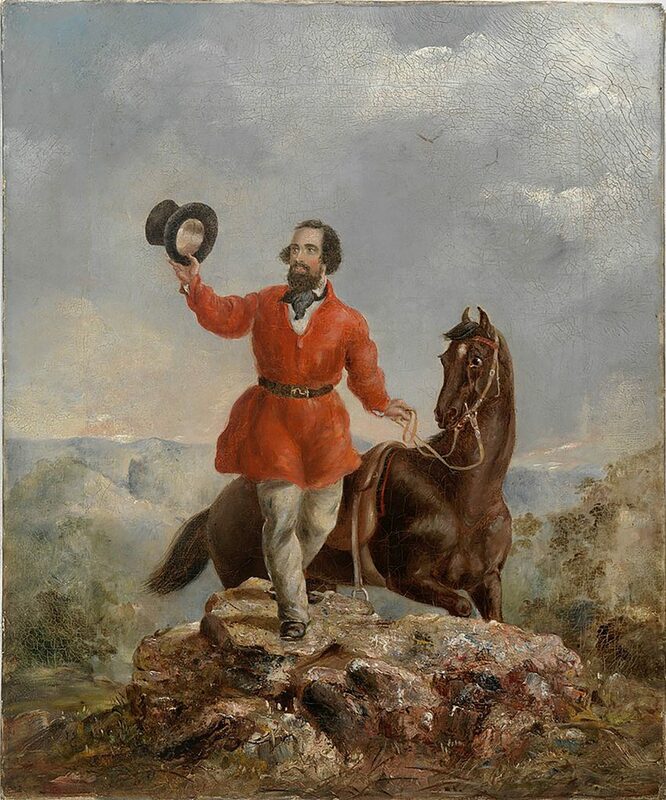 This full length standing portrait shows Edward Hargraves, aged 35, posed on top of a mountain with a valley and open country stretching into the distance behind him, his right arm raised in salute holding a top hat in his right hand, with the reins of his horse in his left hand. An imposing figure, standing about 2 metres tall and weighing around 110kg, the so-called ‘gold discoverer of Australia’ is depicted as the conquering hero returning to the scene of his triumph, signalling to his fellow prospectors at the Summer Hill Creek (later known as Ophir) diggings, having made his discovery known to the Australian authorities and the general populace in Sydney. Hargraves is shown wearing the colourful garb of a typical nineteenth century gold prospector, described by a reviewer in Sydney’s Empire newspaper as ‘the very picturesque style of habiliment affected by our gold-hunter’. His bright red, long-sleeved smock, or over shirt, is probably made of wool flannel. Layered over a white shirt with a black neck scarf, it is belted at the waist – the black leather belt fastened with an unusual gold hook and loop mechanism – and reaches mid-thigh above light khaki [moleskin] trousers and well-worn black shoes or boots. Gold mining was demanding work and miners needed durable clothing to withstand exposure to harsh weather and rough conditions. Work shirts came in variety of materials including linen, cotton, cotton flannel and wool. Popular in patterns and solid colours, dark blue and red (known as Garibaldi shirts after 1860), were often worn in layers especially during the cold months, with a large kerchief knotted around the neck to allow the miner to wipe his brow while working. This portrait was said to have presented a good likeness of Hargraves, however his top hat seems an unsuitable choice of headgear for an expedition into the Australian interior. Such an inappropriate accessory may have been included to lend an air of authority to the subject and counteract his otherwise ungentlemanly appearance. Flat-crowned wide felt hats were the more common choice of miners, and often light-coloured to reflect the scorching summer sun away from their faces. At a time when untrimmed beards were unusual in fashionable society, Hargraves is shown with a lot of hair on his face and head in keeping with the practice of goldfields men who sported long beards of ‘Samson-like vigour and moustaches of Turkish proportions’ (Maynard, p. ). Edward Hammond Hargraves (1816-1891), the so-called ‘gold discoverer of Australia’, was the subject of many triumphant portraits including, most notably this one by Thomas Tyrwhitt Balcombe (1810-1861). Early in 1851 Hargraves had undertaken a prospecting trip in the Bathurst region of NSW, with the intention of discovering gold in the area. On the way, he persuaded local settler, John Lister to guide him to Lewis Ponds Creek with the promise that he would show Lister how to find gold. Arriving at Lewis Ponds and Summer Hill Creek on 12 February 1851, Hargraves instructed Lister in the techniques of gold panning and cradling he had learnt on the Californian gold fields, and returned to Sydney. Between 7 and 12 April 1851, Lister, working with brothers William and James Tom, recovered about 4 oz of payable gold from the site valued at about £12, including one 2oz nugget. Arriving back at Summer Hill Creek on 5 May, Hargraves purchased the men’s gold finds, sending some by mail to the Colonial Secretary, Sir Edward Deas Thomson. Announcing himself as the discoverer of payable gold in the district, Hargraves began a publicity campaign and claimed the government’s £10,000 reward, and an annual pension of £250 (after 1877). Soon after, thousands of gold seekers left Sydney and Melbourne to join the first gold rush. Several months earlier this image had been reproduced as a lithograph, being advertised for sale in the Sydney Morning Herald of 13 June 1851 with a companion print, ‘Gold Diggings of Ophir’. The Mitchell Library holds all three versions of this image which has been described by Bernard Smith as ‘one of the best drawings that has been preserved of this period’. Thomas Balcombe had come to Sydney aboard the Hibernia in April 1824 with his family, his father having been appointed Colonial Treasurer of NSW. He later joined the Surveyor-General’s Department under Thomas Mitchell in September 1830 as a draughtsman. His position as a field surveyor allowed Balcombe to travel extensively, and provided him with many opportunities for landscape sketching. As his artistic talent blossomed, he enjoyed considerable success as an illustrator and made numerous genre works dealing with life in Sydney and beyond. On 2 June 1849, the Sydney Morning Herald critic declared that Balcombe had, ‘long been known in the colony as a very spirited animal painter, but he has now taken a higher flight, and this picture affords an undoubted proof of his ability as a painter of the human figure. It is without exception the best attempt in this style and on this scale that we remember to have seen from the hand of a colonial artist’. His last known works are dated 1857 and Balcombe’s emotional instability intensified in the late 1850s and, on 13 October 1861, he shot himself in the head outside his home in Paddington.